Bubble tea is a generic name given to differently coloured, fruit-flavoured syrups diluted with water, milk and/or weak tea, to which small, chewy pearls or balls are added consisting usually of candied yam, tapioca, sago or jelly. Bubble-like in appearance, the balls are known as “fenyuan” (粉圆 literally means flour balls) or “Zhenzhu” (珍珠pearls). The drink is served hot or iced, and usually shaken to create a foam on top. 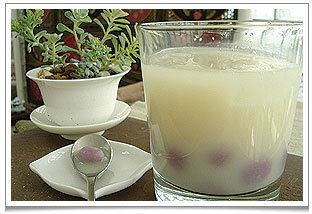 Actually the term ‘bubble’ refers either to the chewy pearls or fenyuan, or the foam topping. The original bubble tea in the 1980s consisted of a mixture of hot Taiwanese black tea, small tapioca pearls (粉圓 fenyuan), condensed or evaporated milk, and syrup or honey, but the most popular kinds now are bubble black tea (泡沫紅茶 “paomo hongcha”), bubble green tea (泡沫綠茶 “paomo lücha”) which is often jasmine-fragrance green tea (茉香綠茶 “moxiang lücha”), pearl milk tea (珍珠奶茶 “zhengzhu naicha”), pearl green & milk tea (珍珠奶綠 “zhengzhu nailü”) and pearl black tea (珍珠紅茶 “zhengzhu hongcha”). – Wash pandan leaves and blend with water and salt. – Sift through a muslin cloth. in the mung bean flour. – Remove from heat and leave to cool for 5 minutes. to fall into the ice water. – Leave the droplets to set in the iced water till firm. – Strain and add to coconut milk with gula melaka syrup. Bubble tea these days has become part of the modern, fast-food culture that appeals to young people and “kidults”. The tea is served in disposable plastic cups, with an extra wide straw to allow the pearls to be sucked up. Everything is plastic and brightly coloured (hence not completely natural and probably not very good for your health). It’s a natural evolution and I have no great objection to it. I guess it is a commercial necessity. But I have to say, it is a million miles away from the slow, understated, relaxed ethos of Teanamu Chaya Teahouse. I was once in the eastern Chinese city of Hangzhou when I spied a little stall called ‘Tea Factory’ making all sorts of bubble tea. My eye was caught by a ‘Dragon Well’ bubble tea, which used the locally produced ‘Top Ten’ green tea highly sought after for its wonderful umami sweetness (especially the top grade pre-Qingming pickings). The thought of Dragon Well mixed with milk made me cringe a bit, but I tried it and to my surprise it was rather pleasant! Ok there were no ‘pearls’, the milk was (at least partly) evaporated milk, and the sweetness was probably chemical and certainly not a natural umami. Basically it was green tea, water, milk and ice. But in the oppressive heat of the early summer, I sat on the concrete paving of the city centre and enjoyed a quite delightful, refreshing drink! So with the heatwave in London, I created my own version of this bubble tea with purple yam mochi. Writing this blog post is reminding me of my favourite childhood dessert, Chendol. This is a delicious beverage from Singapore and Malaysia that existed way before the invention of bubble teas! It is a high-calorie, cold ‘soup’ made with thick coconut milk, Gula Melaka (palm sugar) syrup and lots of shaved ice. Typically, candied azuki beans and soft green mung bean flour droplets are added to the soup. The name Chendol (珍露 “zhenglu” i.e. ‘pearly dews’) actually refers to these green mung bean flour droplets, which are tasteless and are coloured with pandan leaves (and often, I’m afraid, green colouring too). On a hot day in Singapore, this is the perfect Nonya dessert and my favourite “bubble tea”! PS: If you would like to learn more about Nonya cooking, please take a look at the “Kampung Spice” cookery class that I will be running at Cambridge Cookery School in November. I love bubble tea! Some friends introduced me to it when I was at university, and there were a few places in San Francisco that did it really well. I’ve even had it from some places in London. Like you said, it is definitely refreshing on a hot day, bubbles or no! I think it is an acquired taste esp the little “bubbles” but do be careful of the colourings etc that they put in it. 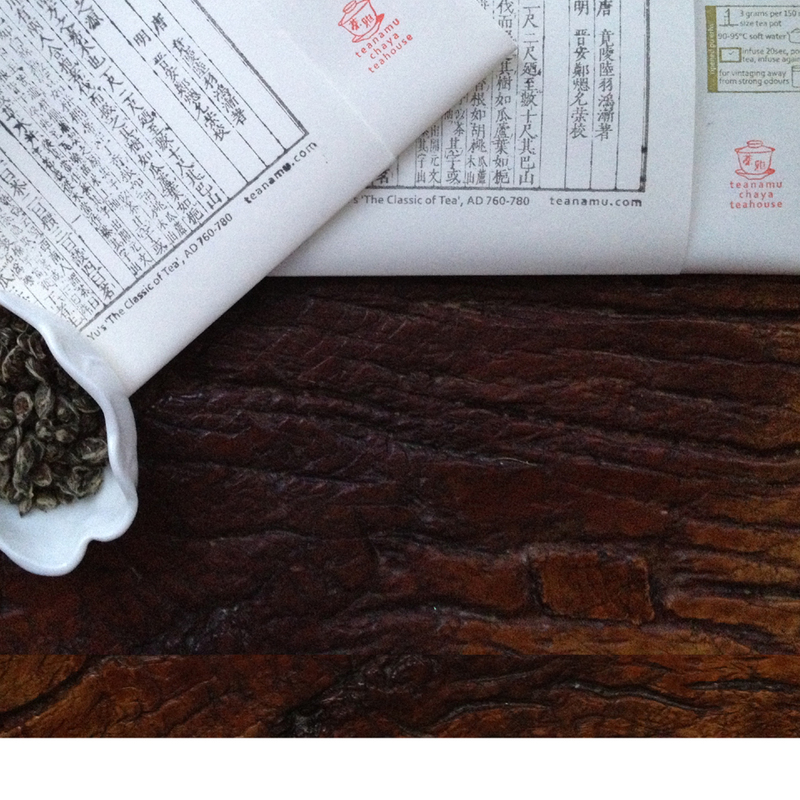 Hope to see you at chaya teahouse soon!